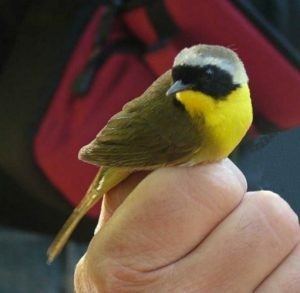 Are you interested in birds and want to learn more about them? What kind of birds are in our local fields and woods? What brings them here? Join Master Bird Bander Strickland Wheelock and his team for a morning of bird banding at Foxfire Farm in Uxbridge, a private farm which is permanently preserved under a conservation restriction managed by Metacomet Land Trust, on Saturday, September 14th, 2019 from 7:30-10:30 AM. Rain date: Sunday, September 15, 2019. Additional morning sessions will be scheduled as weather permits. Space is limited and pre-registration is required. During a banding session, participants see birds up close, learn field marks that help identify the species, and safely release birds after banding. Programs are for adults and children ages 6 and up. This educational program is a fundraiser for MLT to highlight the importance of conserved, open space in the community to the wildlife that depend on it. We invite current and new members to join us on this fascinating morning with Strickland. Donation levels are listed below. Please note that everyone MUST register in advance: registration deadline for the September event is September 7th. It’s necessary to register for this event with Beth Milke veery@charter.net She will provide additional information about the program and payment options.